For years since I was a child, Macy’s has always had The Great Tree lighting on Thanksgiving night. The Great Tree started downtown on top of the Rich’s Department store in the 1940’s then transitioned to Underground Atlanta and ended up at Lenox Square on top of the now Macy’s Department Store. In 2012 a crane removing the fully decorated tree from the roof snapped and the tree slammed into the roof entering the mens store (store was closed at time) and breaking windows on side of building. Macy’s decided it was time to go to an artificial tree (much like Macy’s in San Francisco) and move the tree off the roof to the parking lot. The tree, even though much smaller in size, seemed out of place there. 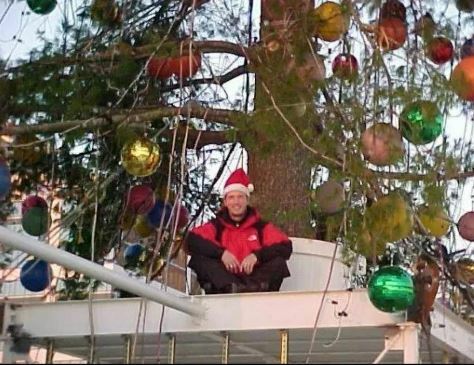 This year Macy’s Great Tree returns to the roof where it all started! Inside sources (elves) say the outcry from the public was overwhelming. So this year look up and #Believe in Atlanta’s annual holiday tradition. I slept under the Rich’s-Macy’s Great Tree for over 2 weeks during the “All I Want for Christmas is a President” campaign in 2000. Set sail with Mariah Carey like you’ve never seen!